For 15 years the Augsburg College Masterworks Chorale has provided an opportunity for alumni, staff, faculty, friends of Augsburg, and current students to come together and make a joyful noise unto the Lord--and for thousands of Twin Cities choral music lovers. The Chorale will celebrate its fifteenth year by performing In Repentence, a piece commissioned by Sergey Khvoshchinsky at its fall concert on Sunday, Nov. 9 at 4 p.m. at Church of the Annunciation, 509 West 54th Street in South Minneapolis. Peter Hendrickson, director of choral activities at Augsburg College, began the Masterworks Chorale mainly to perform orchestral music, which is very different from the repertoire of the other Augsburg choirs. The chorale consists of faculty, staff, alumni, community members, and current students. 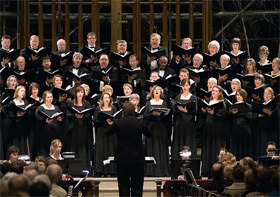 Many members are professional musicians, directors of church choirs, and teachers. "It is a great representation of people from Augsburg and their relationship with the community," Hendrickson said. Staff member Betsey Norgard from the office of Marketing and Communication, education professor Vicki Olson, and business professor Milo Schield currently sing in the Chorale. Norgard, who has sung with the group for 5 years, says singing with the choir gives her another opportunity to be involved with the Augsburg community. "Singing in Masterworks is such an energizing other dimension to my daily work. Just when I begin to think that choir is one too many things in my schedule, I go to rehearsal and realize how much I really need the music. It's truly a privilege to sing every week with great singers and the most gifted director I've known," she said. Hendrickson said the Chorale has been a stable component of his professional life at Augsburg. "I can count on it. It's a group that gets Augsburg's name out into the community to let people know more about the good program we have here." Khvoshchinsky's composition features five movements in five different languages--Hebrew, Russian, English, Latin, and Greek--focusing on the phrase Kyrie eleison (Lord, have mercy). The piece is written for chorus, orchestra, and soprano solo, which will be performed by Lori Lewis. Khvoshchinsky is a native of Minsk, Belarus and has lived in the Twin Cities for nine years. He left Belarus for economic reasons, and Hendrickson said just this year Khvoshchinsky's wife and two children finally were able to emigrate here as well. Said Hendrickson, "He is an extremely passionate, deep soul with an intensity in both his personhood and his musical compositions. When I first met him, I was struck by his passion so deeply that I felt as if I had found my 'Russian brother.'" Minnesota Public Radio broadcast an interview with the composer and Hendrickson on Nov. 7. Read From Belarus to Minn., a composer's journey.